Do we need two photographers? We love when our couples hire two photographers. We usually recommend having two photographers when you have more than 100 guests and when you have multiple locations. For example, a ceremony at a church and a reception 15 minutes away.All of these examples were taken by two different photographers within seconds of each other. Sometimes WITHIN one second of each other! Ashley & Mike did an alternative first look, this can be torture for the groom, but it definitely builds some anticipation before the ceremony 🙂 Two different angles here. One photographer can shoot with the groomsmen, and one can stay with the bride and bridesmaids. Two photographers can really keep the day moving and you’ll be surprised at how many more great photos you can get in HALF the time. This is one of the best times to have two photographers – as the bridesmaids were coming down the aisle the bride’s mom watched as her daughter came out of the limo and was getting ready to walk down the aisle. You can see that single tear coming down mom’s face. Priceless. Two different angles of the ceremony. It saves so much time to be able to shoot with groomsmen and bridesmaids separately at the same time. Again, two different looks of the same moment. While one photographer photographs the couple, one can go to the cocktail hour and get some detail shots. And since you’re paying so much to have us photograph the wedding, why not include Rob in one of your wedding photos?!? 😉 Sort of neat to see a “behind the scenes” shot here. What was Rob shooting? See the next photo below. More details of the cocktail hour during the couples portraits. Especially with larger weddings it’s nice to have two photographers to be able to spend plenty of time with guests at the wedding. We can’t ignore how much fun the guests are having! Here’s two totally different looks from the same moment. Here’s a few examples from Kristen & Eric’s wedding. Again different angles from the same moment. This is such a sweet moment of the father handing off his daughter at the end of the aisle. You can’t see Eric’s (the groom’s) face in this teary-eyed close up, but you can in the second photographer’s frame below. 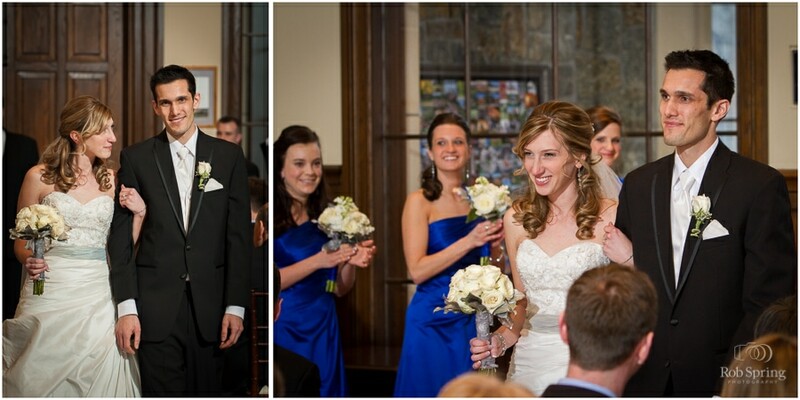 Two angles of the newly married couple exiting the ceremony. This is a nice photo of the Maid of Honor signing the marriage license, at the same time the two moms are hugging and the dads are shaking hands right after the ceremony. You can’t miss that moment, right? The bride’s mom dancing with her adorable son at the same time that Kristen & Eric are having this romantic moment. Personally, we couldn’t imagine living without EITHER of these images! Kathleen and Sean got ready in two different locations, with two photographers, they could both have photos before the ceremony. One photographer can get the “safe” shot of the first dance and the other photographer can be confident to go get an artistic photo. Ali & Ben wanted to have photos separately before there first look. I had a cool idea to shake the pollen off to get this cool effect, so I just hid while the other photographer got this great shot of Ali!